Catherine Denton: Same Outfit Every Day? 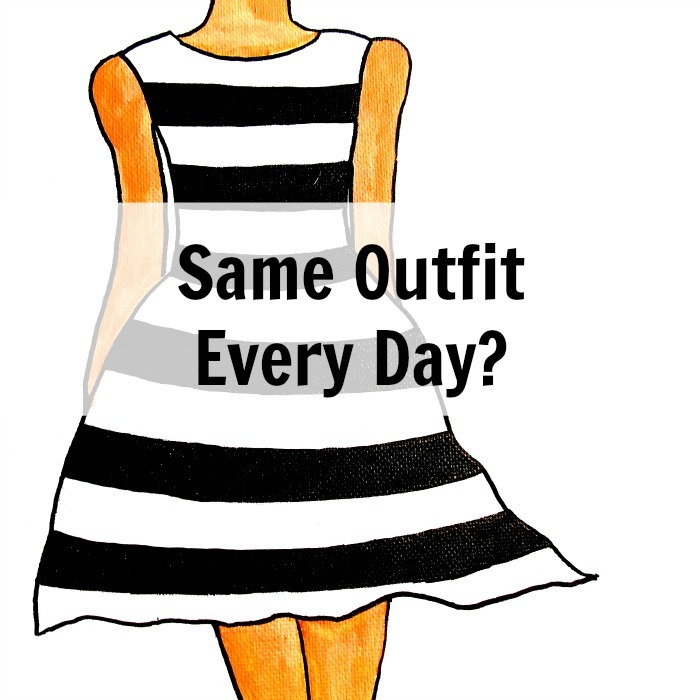 Would you be willing to wear the same outfit every day? Some of the most forward thinkers of our time have done it and are doing it; President Barack Obama, Steve Jobs, Mark Zuckerberg, Alice Gregory, and Matilda Kahl. They've taken one stressful decision out of the their morning routine by wearing the same outfit every day. They do this to keep from wasting precious decision-making energy on items that don't matter and save their best thinking for ones that do. I have long loved this idea and have partially adopted it by creating a "uniform" of clothes so to speak. Jeans, top, cardigan, flats. That's my uniform almost daily. But it's still not as extreme as wearing the same outfit every day because currently mine changes a little each time through pattern/color of tops; color of jeans; and type of shoe. At the beginning of the year I toyed with reducing my 20+ wardrobe down to ten and seeing if I could do a year with ten pieces. The prospect excited me because the thrill of reducing gives me a freedom high. Yet each time I try to reduce my wardrobe to ten, I struggle with choosing the pieces. So if successful women like Alice, and Matilda, are wearing the same thing every day; I'm tempted to do the same. Taking even those last few decisions away and adopting a uniform of exactly one outfit every day. It would be simple, chic and comfortable and I'd never have to decide again. The minimalist side of me jumps at the chance, but the artist side of me hesitates. Then I read somewhere about an artist who felt she could focus her creative energy on her art much easier when she wasn't exerting creativity in her clothes. That quieted my inner protest and has ignited a fire of curiosity. Would it increase creativity? Wearing the same thing every day seems more simple to me than going the route of ten items. Less constricting if you will, which I know sounds completely opposite. I'm thinking of trying it as an experiment, maybe a year, to see how it would feel to wear the same outfit in all seasons. And if I love it, then I'd be set. If I hated it, then I'd be done. I'd like to do a 365 project and take a photo every day to document the process and share how I'm feeling. What do you think? Would you be interested in seeing that? Or do you think I'm crazy? That's so awesome, Alexandra! I loved Marie Kondo's book ~ very inspiring. So happy you're feeling relaxed with less stuff and a smaller wardrobe!